It’s football season. Productive Sundays are only a memory and now the whole day is dedicated to eating and football… at least in Pete’s mind. Last Sunday I played the part of the good girlfriend and made a bunch of appetizers to enjoy during the next 10 hours of football…sigh! Pork wontons, crab rangoons, and apple pie wontons. 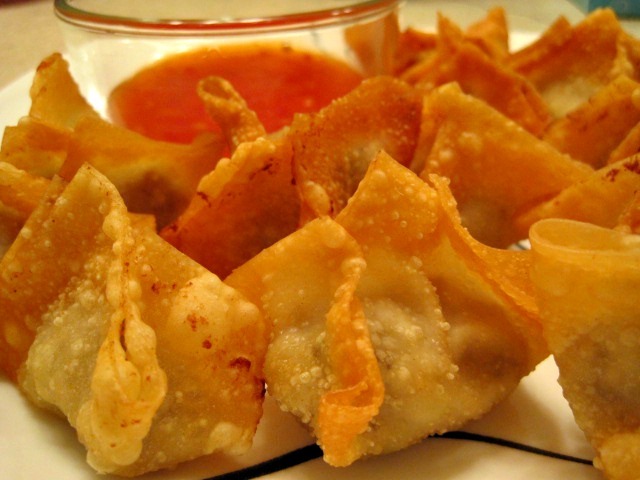 Enjoy this recipe for pork wontons… come back later this month for the other two recipes. Preheat your deep fryer to 350. If you are using an electric skillet, pour enough coconut oil so it rises up your pan about an inch. In a large bowl, mix pork, egg, scallions, salt, and pepper until mixed thoroughly. Taking one wonton wrapper, hold it in your hand spread open. Place a small ball of your meat mixture into the center of the wrapper. Fold wrapper in half over the ball to create a triangle. Dipping your fingers in water, wet the open edges of your triangle. Now take the outer two points and fold in to the top point of your triangle wrapper. Place on your plate and continue until you have used up your meat or wrappers, whichever comes first. When your oil is ready, carefully drop in wontons. If using a deep fryer, cook for 3 minutes stirring after 1 minute. If using an electric skillet, cook for 3 minutes flipping halfway. Using tongs, carefully transfer to a bowl lined with paper towels. Serve with sweet chili sauce. 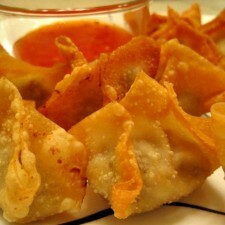 This recipe makes a lot of wontons… if you don’t think you will eat them all, only fry what you are going to eat. Freeze the rest to enjoy later.